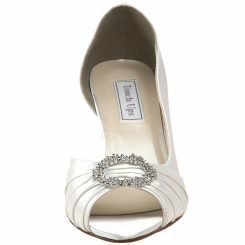 The Touch Ups Dolly is a high heel, dyeable sandal. It has a platform bottom with strappy front. The front straps are decorated with large stones. 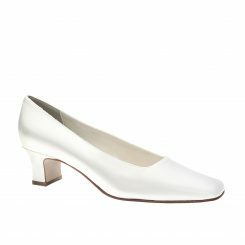 The Dolly is available in White Satin and sizes are limited! 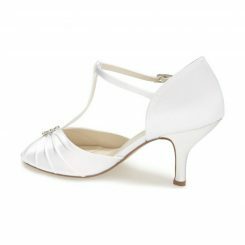 Touch Ups Dolly white is a modern and fun dyeable high heel shoe. 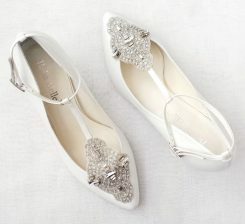 There is a thick strap that lays across the front of the foot with gems and rhinestones that decorate the top of it. 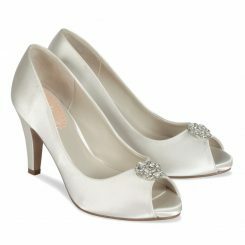 The heel is high, yet it is sturdy with a platform to help with the pressure put on the ball of the foot. 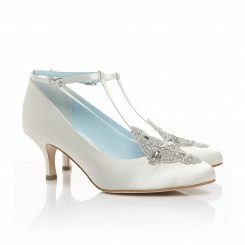 Dolly has an adjustable ankle strap that moves to fit your foot perfectly. Touch Ups Dolly is a dyeable shoe that can be custom dye to any color you like. 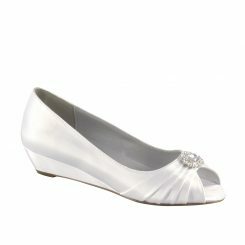 This shoe looks great dyed and is perfect for bridal parties or prom. 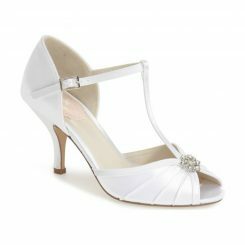 You won’t have any problem dancing the night away with this fantastic heel.